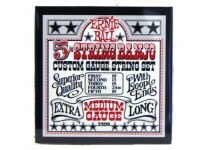 Banjo strings from Ernie Ball. We have sets of strings for 5-string banjo. Choose from light or medium gauge string sets to suit your playing style.